Women are twice more likely to experience anxiety disorders than men. While most women do not associate menopause with anxiety, increases in this psychological phenomenon are common during the menopausal transition. Because estrogen and other hormone fluctuations during menopause affect the brain's regulation of mood, hormonal changes can cause some women to experience anxiety during menopause. Anxiety in menopause can range from a mild annoyance to a major hindrance. While most menopausal women do not necessarily develop a clinical anxiety disorder, these conditions are not uncommon. 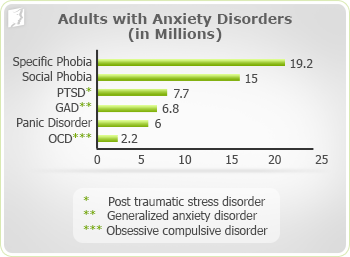 In fact, anxiety disorders affect more than 40 million Americans. For women who are concerned about anxiety during menopause, it is extremely valuable to gain insight into anxiety, its various types, its symptoms, and its causes. Understanding these aspects of anxiety can help women determine the best way to manage anxiety during menopause. Continue reading to learn more about anxiety. Anxiety is a psychological state characterized by excessive and persistent worry, tension, and nervousness. In its mildest form, anxiety can be productive, compelling a person to complete tasks under pressure or be cautious in dangerous situations. However, some people experience inappropriate, excessive, or long-lasting anxiety, which can impede daily life. Anxiety can be experienced as a constant psychological state or may come in the form of acute episodes, known as panic attacks. Anxiety during menopause can be a transient emotional challenge or it may indicate a more serious condition. In any case, the first step in managing anxiety is to better understand this common menopause symptom. Read on to learn more about the types of anxiety disorders. Anxiety can manifest itself in a variety of forms. Many menopausal women do not experience anxiety as a disorder, but rather as a temporary emotional condition. However, it is important to be aware of the types of anxiety disorders, for which treatment may be necessary. Clinical anxiety is actually a group of psychological disorders, each with their unique set of causes and symptoms. While any of these can occur during menopause, generalized anxiety, panic disorder, and social phobia are more likely to develop as a result of menopausal hormonal changes. Depression, alcoholism, and substance abuse are commonly associated with anxiety during menopause and at other times. Generalized anxiety disorder (GAD) is characterized by a persistent state of exaggerated worry and fear, often when there is little or nothing to provoke it. People with GAD often anticipate disaster and worry excessively about health, family, work, money and other everyday issues. Often, just the thought of facing a new day can trigger anxiety. In order to be diagnosed with GAD, a person must typically experience this excessive concern, worry, and tension nearly every day for at least six months. Panic disorder (PD) is characterized by recurring acute episodes of sudden terror and overwhelming dread, which produce a variety of emotional and physical symptoms. Many people suffer panic attacks but do not necessarily have PD, which is characterized by frequent and intense attacks that significantly impede on daily functioning for an extended period of time. Extreme panic disorder can lead to agoraphobia, or fear of open spaces. Social phobia involves excessive worry and self-consciousness about everyday social situations. Some people with social phobia fear being judged or behaving in a way that might be embarrassing or ridiculed. While social phobia can occur alone, it sometimes develops in patients with untreated anxiety who develop an overwhelming fear of being in situations that may trigger or worsen their symptoms. These are the most common types of anxiety that can occur during menopause. However, menopausal women may also experience post-traumatic stress disorder after surviving a traumatizing experience or obsessive compulsive disorder, characterized by irrational preoccupations. Specific phobias can also develop in people with anxiety disorders. These disorders are not related to menopause. Now that the types of anxiety disorders have been discussed, the next important step is to learn more about the common symptoms of anxiety and when a doctor should be contacted. Please read on for helpful information about the symptoms of anxiety. Many women who suffer with problems relating to mental health often hope that the condition will go away over time. Unfortunately, this is rarely the case, and so it is important to acknowledge and accept that you might be experiencing chronic anxiety as early as possible. Anxiety disorders affect 40 million Americans on average and are twice as common in women as in men. Hormone fluctuations and stress are common triggers of anxiety in middle-aged women who are going through the menopause transition. Exercising, eating healthy, and taking time to relax are all possible treatment options for anxiety and stress. Anxiety disorders affect 40 million Americans on average, and is twice as common in women as in men. Social anxiety disorder is defined as the intense fear of being publicly humiliated. It can be caused by previous emotional trauma and range from mild to severe.